How do you feel about finger guns? Precocious robot companions? How about hijinks? You feel warmly toward all of the above, you say? Okay good, good. Then strap in, friend-o, because I’d like to talk to you about Tales from the Borderlands. Unlike previous Telltale offerings like The Walking Dead, Game of Thrones, and The Wolf Among Us - all based on well-loved tv shows, novels, or comics - Tales from the Borderlands derives its story from the plot of the first two Borderlands games, an offshoot tale set in the same universe as the main games sometime after the events of Borderlands 2. A video game based on a video game may sound a bit navel-gaze-y on paper, and I will grant you that those who haven’t played or enjoyed Borderlands titles may find that to be something of a barrier to entry. However, thanks to the clever plotting, likable protagonists and snappy dialogue Tales from the Borderlands will appeal to audiences far beyond only those who enjoyed the original games. Tales from the Borderlands is gorgeous; let’s just get that out of the way right out front because it’s damn near undeniable. Telltale games tend to have a recognizable look in their own right, but like The Wolf Among Us before it this game lends itself particularly well to the developer’s signature visual style. The Borderlands games feature a distinctive blend of graphic novel-style heavy outlines layered over hand-drawn textures and this look meshes beautifully with the style that Telltale has developed over the course of its recent games. In short, the look is spot-on from top to bottom and perfectly captures the style of both the developer and the source material while paying homage to Borderlands’ graphic novel/comics-inspired roots. The goofs come fast and thick in Tales. The phrase “face pizza” is used more than once, one tranquilizer dart yields several hours worth of visual gags, and one of the later episodes features what is hands-down the greatest gunfight I’ve ever seen. (It features accountants; trust me, you’ll know it when you see it.) The script is probably about 70% jokes by weight and ties in beautifully with the abundance of visual gags. From a silent double-eyebrow-raise following a smartass remark to the way one narrator is caught in a lie and corrected by the other, Tales is chock-full of those clever little touches that make the exaggeratedly cartoonish characters seem unexpectedly realistic. Aside from the surface-level laughs, the way the characters use humor to interact - joking and making fun of each other in both lighthearted and derisive ways - is used as a tool for illustrating their insecurities and the way they feel toward others. Additionally, the few scenes where there is absolutely no joking around are heightened by the lack of humor, effectively driving home the gravity of those moments. And for all the goofing around the game does an excellent job defining each character and their relationships with each other. There are no two-dimensional characters in the game’s core group of misfits; each is imbued with a fully fleshed-out personality with their own distinct history, goals, fears, and motivations. For all of the jokey-jokes and ridiculous action Tales does a commendable job of balancing the comedy with drama and creating an eccentric and likable cast of characters. Protagonists Rhys and Fiona are respectively voiced by Troy Baker and Laura Bailey. One of the first villainous characters you come across is voiced by Patrick Warburton in a obviously perfect bit of casting and it is glorious. Really, peak Warburton here. Chris Hardwick even makes a surprisingly non-standard-Chris-Hardwick-y turn as Vaughn, Rhys’s co-worker and bff. Need I say more? Okay I’ll say more. 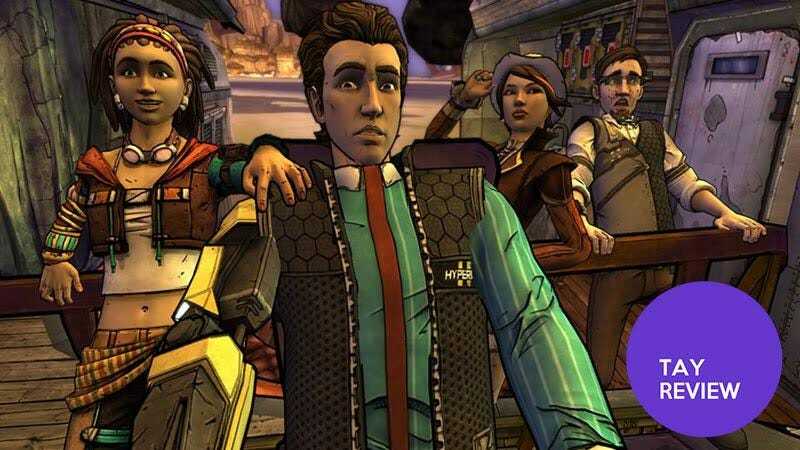 The quality of voice acting can have a huge influence on the player’s experience, and nowhere is that more evident than with narrative-heavy games like Tales from the Borderlands. A truly great performance can elevate cookie-cutter characters into legends - imagine if you will Mass Effect without Jennifer Hale or Keith David, Final Fantasy XII without Gideon Emery, Uncharted without Nolan North. What I’m getting at here is that hiring talented actors for these pivotal roles can elevate the material immeasurably and bring to life characters that gamers will remember and possibly dress up as for years to come. Conversely, sloppy or flat voice acting can absolutely tank a game within ten minutes. Have you ever played Bound by Flame? I ended up changing the language to French because my god the English v.o. was nigh on unbearable. Point is, voice actors make a huge difference to the feel of a game and long gone are the days when developers could throw any chump in the booth to be their Barry Burton. Telltale has been consistently wonderful in the care they take with casting voice actors, and Tales from the Borderlands is no exception. Pretty great, right? The soundtrack and the way it works with the gameplay was clearly crafted with love. If you’ve played a Telltale game you’re familiar with the dialogue mechanic in which the player has a very short amount of time to choose their response. In Tales the abbreviated options that the player chooses pretty well represent what the character will say, which is often an issue with Telltale games and similar RPGs in general. However the mechanic in which the player is given a split second to choose which of two actions to take in a critical moment doesn’t do as good a job in giving the player an idea of what each choice will entail. If you were given a split second to choose between “Blow His Mind” or “Break His Heart” what would you do? What does that even mean?? So no, the options don’t really tell you what the outcome will be. I personally was never given reason to reload and pick the other option, and in fact am not convinced that these choices even remotely carry the sort of importance that they do in the other Telltale games. The larger issue that I had with player agency in Tales was the way in which the game seemingly tries to steer the player toward certain plot choices. I mean, how many times do I have to choose not to flirt with Sasha before the game will stop trying to get me to romance her? This aspect really illustrates the fine line between player agency and telling a coherent, linear story and how tricky it can be to pull that balance off. Maybe (probably) it’s just that I have the sense of humor of a middle schooler but I feel like Tales from the Borderlands is raising the bar for comedic games. Not only funny as hell from beginning to end, it does a pretty great job of balancing all of the humor with drama, warmth, well-rounded characters and a healthy dose of action in each episode. The ridiculous, over-the-top plot and action sequences pair perfectly with the semi-cartoonish look, pervasive sense of humor, and overall high spirits of the rest of the game. If this review reads as one big love letter to Tales from the Borderlands, well, that’s not entirely inaccurate. What can I say, I’m a sicko for a good goof. If you’re looking for grimdark realism in your games, good lord, look elsewhere. But if you have a deep appreciation for exuberant silliness done exceptionally well I implore you to give this one a try. Nicole T (street name: Barkspawn) lives in California and tried SO HARD to fit a “Jill Sandwich” reference in there when mentioning Barry Burton. You can find her on Twitter @ser_barkspawn, contact her here, and read more of her articles here.